Every year $10 million is given out in grants. This is free money. Where does it come from? From duties on imported seafood. Each year there are more than 300 applicants who submit their Saltonstall-Kennedy proposals. Unfortunately, very few fishermen apply. Why? If you look at the paperwork required, you too would be confused. You need to be a professor to be able to write a proposal that would be accepted. Perhaps the National Oceanic and Atmospheric Administration should provide our fishermen with people to help them with the paperwork. After all, this is what the Saltonstall-Kennedy funds were for. Unfortunately, this has not been the case. Over the past 10 years, these grants go to universities to develop tracking devices or other types of monitoring systems, and normally some professor makes extra money. And after a review panel has made its recommendations, it is NOAA who makes the final selection. Personally I think the whole Saltonstall-Kennedy grant requirements should be reviewed and simplified so the fishermen would have a better chance. I also think it should be reviewed by not only NOAA but by some other board — this could be a combination of financial advisers and other experts. The bottom line is the Saltonstall-Kennedy grant was created to help our fishermen and in my opinion this is not the case. Something should be done to correct it. Lets look back into past of fishing ,In 1950s to 1980s ,most of the fishing boats were eastern rigged side trawlers, and were limited to how much wire that could be used in front of their net. Most of the boats used 15 ftms legs, and 15 ftms ground cables before their net. During this time period, fish stocks were good and sustainable. Lets talk about THE WIRE BEFORE THE NET. The wire used before the net makes a mud cloud when it makes contact with the ocean bottom and most fish will not cross this mud cloud. This called fish herding. That makes the wire just as important as net for catching fish. THIS IS A FACT, THE MORE WIRE USED BEFORE NET, THE MORE FISH YOU ARE GOING TO CATCH. Today stern trawlers can use up too 100 ftms legs and 100 ftms of ground cables, which is approximately 7 times the area that was covered by the old eastern rigged side trawlers, who used 15ftms legs and 15 ftms of ground cable. Remember this area of bottom covered when not moving ahead . Talking to other coastal fishing fishermen, they would go back to fishing ways of the past, TO MAKE FISHING SUSTAINABLE, AS IT WAS IN PAST FOR ALL USERS OF OUR COASTAL WATERS !!! NOAA HAS TO CHANGE THEIR WAYS AS OUR OCEANS ARE CHANGING!!! Noaa has been spinning its wheels for the last twenty years , spending lots money , only to have less fish and more restrictions . Noaa only accomplishment has been eliminating jobs and commercial fishermen in Gulf of Maine ,, it seems that’s was their goal ? If I was a younger person I I would move to SOUTHERN NEW ENGLAND AREA TO FISH because their regulations are less stringent than GULF OF MAINE REGULATIONS . I wonder if GULF of MAINE FISHERMEN rights are being abused, different standards for different fishermen .I guess fishermen are are not all CREATED EQUAL IN NOAA EYES. Here is a quote from Seth Kapan, V.P. for climate policy at C.L.F. ;; WE LIVED ON A DIFFERENT PLANET WHEN THESE LAWS AND REGULATORY SYSTEMS WHERE PUT IN PLACE !1 ,HE HAD TO BE TALKING ABOUT OUR FISHING LAWS AND REGULATIONS . Noaa and some Environmental Groups, who have spent millions of dollars to blame fishermen for the lack of fish in Gulf of Maine . Open up your eyes and ears , especially your brains .The problem is the Pollution of our coastal waters ! QUOTE FROM JULIA EKSTROM , director of climate adaption program ,University of California ,Davis . Our oysters and scallops and other shellfish are being cooked by OUR ACIDIC SEAS, SO IF ACIDIC SEAS IS COOKING SHELLFISH ,,SO WHATS HAPPENING TO OUR FRAGILE CODFISH EGGS AND SHRIMP EGGS , I THINK THE WORST , NO CODFISH ,NO SHRIMP AND PROBABLY MANY OTHER SEA CREATURES ARE BEING AFFECTED BY ACIDIC WATERS . CLIMATE CHANGE HAS RAISED OCEANS ACIDITY BY 25% WITH HIGHER PERCENTAGES STILL ARE COMING , IF THIS PROBLEM ISN’T ADDRESSED? NOAA AND ENVIRONMENTALIST MUST FIX THIS PROBLEM FIRST , INSTEAD SOME OF USELESS RESEARCH GRANTS THEY FUND !! NOTE STILL THINK FISH AND SHRIMP HATCHERY’S IS WAY GO ! Drastic reduction of halibut PSC, primarily among the groundfish trawl fleet, especially as it applies to the wanton waste associated with the conduct of fishing YFS (yellow fin) and rock sole – products of little to no benefit to USA consumers, with no value-added economic justifications in the USA. Refocus on also building future stocks, i.e. the adjoining mitigation approach – not just concentrating on bycatch – of hatchery and farming programs consideration. Getting over the idea of not allowing finfish farming when there may be good reason to take advantage of it, when appropriate and applicable. Note that #2 necessitates #1, as if the groundfish trawl segment continues practices affecting massive quantities of 26 inch and under halibut, juvenile removals will remain too high, and most hatchery assistance will go to waste, as well. Greater adherence to the Precautionary Approach (UN/FAO and US Commerce guides)andarethinkingofMSYversusMEY. No fishery that we deal with so often demonstrates the fallacy of running TAC and Bycatch/PSC caps up against the steep precipice of the sustainability curve, far to the right (x-axis) as halibut in Alaska. No wonder there is a collapsing directed fishery. If the YFS and rock sole fishing activity does correlate to 67% of the trawl groundfishery total mortality of approx. 87% (some say under IPHC recommendations, that would become 92%) for areas 4CDE halibut, then it means (87 x 67 =) 58.3% is attributable to those non-pollock non-pelagic zone conduct (i.e. 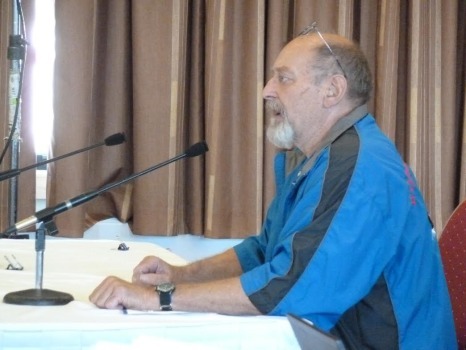 it substitutes a must fish on the bottom approach of greatest damage to halibut stocks) – per AMCC public comment. fishermen in the directed fisheries may be said to be attributable to the YFS and RS fisheries, [albeit] of limited USA value. Consideration of possible changes in MSA related to “overfished” (i.e. blame it on the fishermen word games) to “depleted” (i.e. there are many other causes, foremost of which is “low recruit survival” – read as unwarranted non-precautionary trawling destruction). “Depleted” may call for the obvious required changes you so long to grasp in the realm of conservation, sustainability, and greatest maximum value to the USA. Accordingly, Groundswell favors the inclusion of the alternative option for an immediate, emergency rule action, 50% reduction in the trawl fisheries for halibut bycatch. Please, put a chain on that dog. There are others in the ocean park, too. AT THE PRESENT TIME, THE WHITING STARTS ( JULY 15 AND ENDS NOV. 15 ) ,DUE TO GLOBAL WARMING AND CHANGES IN OUR OCEAN , WHITING HAVE BEEN ARRIVING EARLER , AND ARE GONE SOONER . THIS PAST YEAR, THE WHITING LEFT AREA BY AUG. 30 , 2014. THE WHITING RESOURCE IS HEALTHY STOCK AND OVER FISHING IS NOT OCCURRING. .MR. BULLARD, YOU HAVE THE AUTHORITY TO OPEN AREA 1 , UP 15 DAYS EARLIER, (( JULY 1, 2015 ) WHICH WOULD KEEP FISHERMEN FISHING AND IF YOU DO NOT OPEN THIS AREA UP, WOULD YOU GIVE TWO BOATS SPECIAL EXPEMTION PERMITS TO DO RESEARCH PROJECT WORK FOR EARLIER A OPENING IN 2016. ALL OF THE FISHERMEN ARE SEASONED CAPTAINS,THAT FISH AREA 1 AND WE CARE ABOUT CODFISH AS YOU DO? WE KNOW, WHERE THE CODFISH ARE, AND HOW TO AVOID THEM. I HAVE FISHED GULF OF MAINE FOR FORTY YEARS. IN THIS TIME, I LEARNED WHERE CODFISH USUALLY ARE , AND WHERE THEIR SPAWNING AREAS ARE AND THE TIME OF SPAWNING WITH IN TEN DAYS. MOST VETERAN FISHERMEN KNOW THIS . MOST CODFISH SPAWN IN 40 TO 60 FTMS., WHICH IS A SMALL AREA CONSIDERING THE SIZE OF G. O. M. AREA ( 80.000 SQ. MILES ). I CAN’T UNDER WHY MR. BULLARD WANTS TO CLOSE SO MUCH AREA ? WE ALREADY HAVE THE JEFFERY LEDGE CLOSURE , WHICH PROTECTS A LARGE AREA WHERE THERE IS LARGE CONCENTRATIONS OF CODFISH. LAST WEEK GLOUCESTER’S SMALL BOAT FLEET CAUGHT HIGH AMOUNTS OF CODFISH . MR. BULLARD STATED; THE CODFISH ARE BUNCHING UP BECAUSE THERE NOT MANY CODFISH LEFT ( RIDICULOUS ANSWER ). SAND EELS WHICH CODFISH FAVORITE FOOD ARE BACK IN OUR LOCAL WATERS. CODFISH LIKE MOST FISH FOLLOW THEIR PREY. IN 1990, ON THE RV ALBATROSS, I WAS ON THEIR 21 DAY SURVEY, WHEN WE WERE IN G. O. M. AREA, THE ALBATROSS MADE 10 TOWS , AT 20 MINUTE A TOW WHICH COVERED 1 MILE EACH TOW. WE CAUGHT VERY LITTLE CODFISH. I ASKED , WHO PICKED THE AREAS TO BE TOWED,, ANSWER WAS A COMPUTER DID . IN MY FORTY YEARS OF FISHING IN G. O M. ,THERE WAS PLENTY OF DAYS WHEN I DID NOT CATCH ANY CODFISH. SO, ALBATROSS COVERED 10 MILES OF G,O,M. AREA, OUT OF 80,000 SQ. MILES , THIS DOES NOT GIVE TRUE PICTURE OF OUR FISH STOCKS. I BELIEVE TODAY’S SURVEYS ARE SAME AS THEN. FISHERMEN SHOULD BE ABLE TO PICK THE TOWS ON NOAA SURVEYS!!!!!! Once again, I find it difficult to understand, as indicated by the attached article, how a poor working stiff fisherman is hauled all the way to the Supreme Court for discarding two fish. As I am sure you will recall, your Mr. Dale Jones (at the time, head of enforcement) admitted to Congress, on camera, that he routinely shredded documents, including those under scrutiny, and he appeared to be smiling when he admitted it. Mr. Jones apparently was confident that he was in safe hands. A short time later he was given a cushy reassignment and a raise. Crime pays when you work for the government! As Chief Counsel for the NMFS, as well as a Officer of the Court, it is apparent that you have a conflict of interest but yet nothing seems to change. The corrupt prosecuting attorneys that were under your direct control continued unscathed. As the Zinser report exposed them, the corrupt U.S. Coast Guard judges, including Chief Justice Ingolia, were simply let off the hook. No charges; no nothing. The only attempt to salvage the scandal was a half hearted attempt by Secretary Locke to have a independent Standing Master review complaints. Albeit, unknown to the average reader, only one percent of the fine money was returned and even that effort is subject to suspicion. It was never revealed what funds paid the fee of Standing Master Swartwood. Are we to assume the Asset Forfeiture Fund? If so, the entire matter would be back on square one. Beyond belief,!…. a novelist could not make that one up. The Freedom of Information Act has turned into another joke. Exorbitant fees for any information have made transparency of your agency out of reach for the average person although the information was collected at taxpayer expense. The indication would be that things are back to the same old-same old….good times are here again. Trips to Europe, extra cars, luxury yachts, unchecked expense accounts…all embezzled money from the Asset Forfeiture Fund. The duel standards to which your agency subscribes has placed it firmly within the category of a rogue agency and incapable of managing anything. I know….you just work there. THIS GRANT SHOULD BE A TRI-STATE GRANT INCLUDING MASSACHUSETTS,NEW HAMPSHIRE AND MAINE.THE LOCATION OF HATCHERY SHOULD BE LOCATED ON ISLES OF SHOALS OFF THE COAST OF NEW HAMPSHIRE , WHERE THERE IS PRISTINE AND DEEP WATERS CLOSE TO A NATURAL SPAWNING AREA. ,THIS SHOULD BE A MULTI-SPECIES HATCHERY, CODFISH,IN SPAWNING SEASON , LOBSTERS IN THE WARMER WEATHER AND MAYBE TRY TO PUT SALMON BACK IN OUR WATERS . THIS HATCHERY WILL BE GOOD FOR BOTH COMMERICAL AND RECREATIONAL FISHERMEN. THE ENVIRONMENTALISTS WOULD APPROVE OF THIS ,BECAUSE PUTTING FISH BACK INTO OCEAN. ,,I KNOW , THIS WOULD BE COSTLY PROJECT , BUT IT WOULD WELL WORTH IT., BENEFICIAL TO OUR ECONOMY . THE USA GIVES LOTS OF OUR MONEY TO FOREIGN COUNTRIES TO HELP THEM,BUT IT SEEMS , WHEN COMES TO HELP AMERICANS CONGRESS HAS CLOSED EYES OR JUST DON’T CARE!!!! OUR NEW ENGLAND POLITICIANS ,SHOULD MAKE THIS HAPPEN!!!! I’m writing to tell you that I’ve accepted a new job and, for that reason, have resigned as a member of the New England Fishery Management Council. I’ll be working with The Nature Conservancy’s Sustainable Fisheries Initiative in California and look forward to continuing to work with fishermen to meet the many challenges that face our marine resources and the fishing industry. In light of our soon to be expanding family, we’ll need to make the move west faster than we otherwise would have. I regret that I likely won’t have the chance to see many of you in person before I leave, but I trust our paths will continue to cross in the future. I’ve learned a tremendous amount from my years on the Council and appreciate the time and effort you all put into addressing the issues facing New England’s fisheries. Recently I inquired from the Department of Commerce how much of a monetary incentive was received by the prosecuting attorneys at the Office of Law Enforcement-Gloucester for the ‘successful’ prosecutions of particular fisheries violations. This agency policy of rewarding prosecutors was exposed by the now famous 2010 Zinser report. I was informed that this information was available only by going through the labyrinth of the Freedom of Information Act. I then went forward and requested this information under the ‘FOIA’ as it applied to the National Marine Fisheries Service and also sighted the new policy of a more ‘open book’ that had been adopted by the agency. I was informed that there would be a charge of $500. for the information. Astonishing to say the least! That’s just the beginning. On, or about, Sept. 15th, 2014 I inquired from the same FOIA office the following information: ‘Please forward information on all monetary disbursements from the Asset Forfeiture Fund (NMFS) …(who were the recipients and what was the dollar amounts and for what purpose) from 2010 to the present (August 31, 2014). Also, what is the current balance in the account. The charge for that request would be $2965.44 …letter attached. Business must be booming! On the other hand, commercial fishermen and fish dealers are required to file weekly reports of landings, on line, and face stiff fines for failure to so. These individuals and taxpayers have computer and office expenses as well as spending their own time in performing these conscripted acts of mental and physical exertion. What are they paid? NOTHING. When I inquired as to why, I was told it’s simply the cost of doing business. NEWS FLASH! Monies are provided for distribution to the maritime states by the Saltonstall-Kennedy legislation of the late 1950’s. Those monies were mysteriously diverted to the operation budget of the NMFS in 1980 and guess what? Nobody knows where it goes. Shredding is a mater of routine (it’s obvious why) as was told to us by Dale Jones, head of enforcement, during a congressional investigation which was triggered by the Zinser report. Let’s put the two above together! Charging citizens for public information which has already been gathered at taxpayer expense… should be free. If not, dealers and fishermen should be paid for their conscripted reporting services. Once again, at the present time, the failure to submit timely reports by fishermen and dealers subjects those individuals to massive fines and the Zinser Report has told us where that money goes. At the same time there is plenty of money available to aid the fishing industry as noted above, but nobody at the NMFS knows where it goes? This agency has already been characterized by our elected officials as a rogue agency. Subsequent to the Zinser Report, the head of the NMFS, Ms. Lubechenco was fired. Unfortunately, the individuals who participated in the obstruction of justice, embezzlement, perjury and deprivation of constitutional rights- were given raises, promotions and early retirement! This agency has, once again, laid claim to the title of a rogue agency by shrouding itself in secrecy and placing roadblocks to inquiries. I wonder what’s up this time. Hey, Mr. Zinser, crank up the machine ….it’s time to go to work again. Toby Sullivan wrote a great piece on the early Kodiak crab fishery. A kick in the mouth with a reminder that the community of Kodiak was built on crab. This city, the state and federal government have spent up to one billion dollars in often unbelievable financial indebtedness and flat-out government largesse, all taxpayer drains. Compare that with an embarrassingly low amount on restoring king and tanner crab fisheries this past decade — a couple of million, and there’s no fishery to show for it. Elected officials wouldn’t know how to generate a true return on investment from a wasteful meal plant grinder. Every year taxpayers go further into debt while working fishermen and America’s consumers lose out. Officials act like there’s a financial money tree somewhere that justifies bond assessments, and funds huge buildings — with big offices for administrative malingerers with large computer banks. They believe the 2008 global financial collapse offers no lessons that America is still headed for the real financial collapse. You can’t build a nation or a city on worthless paper derivatives and debt. It takes real income-and tax-producing investments. Crabbers did our part for decades. We’re the reason Kodiak grew into a nationally important fishery dependent community. There used to be shop owners and restaurants and other providers who once prospered as a thousand crab skippers and deckhands shopped here. Now look at our disheveled and dismantled downtown businesses. So, do you care or not, for this community? If so, then get off your taxpayer draining backsides and lobby your hearts out for a crab restoration effort that would spark our economy once again. If not, then please resign and get out of your cozy office, so someone who does appreciate this town can take over. Gentlemen, I am addressing these comments to you and not the council because I believe you are the people that have to address the issue. From my perspective, as a scientist, NOAA committed two unpardonable sins with its press release on Gulf of Maine cod on August 1. Science was replaced with advocacy that day when statements were made about the condition of cod, and that immediate action must be taken after a secret, experimental stock status update before peer review. Indeed no supporting data was released for almost three weeks. The second sin was that fishermen in the Gulf of Maine were tried, convicted, and executed by their own government without one shred of evidence being offered. As someone who has always extolled science based management to fishermen as the proper way to move forward, my belief has been shaken to the core and cannot and will not be restored any time soon. I have struggled and continue to struggle with conveying to you the seriousness of this situation without appearing overtly hostile. For the record, I feel the people who performed the assessment genuinely believe their results and that is the problem. I am here today to tell you unequivocally that what is described in this document is not what is being seen on the water. I believe the problems with the assessment, that all of us are witnessing, stem from an overreliance on the trawl survey combined with little fishery dependent data being available because the fishery was essentially shutdown by the last management action. Catch per unit effort data can no longer be used as a tuning index because the unreasonably high price of leased fish in so many of the stocks prevents fishermen from filling the quotas. This is being misinterpreted as lack of fish, when in fact vessels would drive themselves to bankruptcy catching cod, haddock, plaice, graysole and yellowtail all of which have lease prices that exceed their landed values even before accounting for the expenses of fishing. My son stated the problem succinctly in his PhD. dissertation, “Modelers must familiarize themselves first-hand with the realms they model”. If that had occurred in this assessment we would not be sitting here today. My request, then, is that you pull this update back from consideration as advice for management and initiate the beginning of the benchmark assessment that is scheduled for 2015. Absent this being done, I must lay out for the administrative record the list of reasons that this process has not met the burden of National Standard 2, the so called best available science standard. First, despite having a number of highly qualified cod scholars in New England this update was conducted in secret with input from only a handful of handpicked unknown people. Since none of those people were included or consulted none of the numerous, outstanding issues surrounding the last assessment were addressed or corrected. Second the press release, wide dissemination, and extensive commentary made independent peer review impossible. To paraphrase Dr. Pat Sullivan chair of the review committee, there are problems with this assessment but if we reject it we will be seen as the people who gave up on Gulf of Maine cod. Third, the information available to the reviewers and the public was insufficient to verify the results. Although several modelers were part of the review committee they had to request a science center employee do model runs at the end of the first day of the review because they had insufficient information to do tests in advance of the meeting. This violates the most basic tenet of science that sufficient information be provided so other scientists can verify the results. Fourth the issue of M ramp and how M is going miraculously return to .2 next year was not scientifically explained. Miracles are the realm of religion, not science. Fifth, issues related to outstanding cod assessment issues were dismissed with the statement that this is an update, not a benchmark. This is particularly relevant to the stock boundary issue. Peer reviewed articles are now available which show through DNA analysis that cod off Rhode Island and in the Great South Channel are Gulf of Maine, not Georges Bank cod. If the stock boundaries are wrong, the management measures will unfairly penalize people in the Northern Gulf of Maine while sparing people in other regions. This violates National standard 4. Sixth, No ecosystem reference points were provided despite a binding vote of the council in April 2012 requesting them in all future assessments. Finally, although not part of the actual assessment, work by the councils plan development team has produced a second miracle to rebuild cod by 2024. With cod catches set essentially at zero they can only achieve the spawning stock biomass reference point by 37 to 40% annual growth for all of the next ten years. F-rebuild projections may be overly optimistic. This is probably the understatement of the decade. This is not an inclusive list of issues, but rather in the interest of time, a sample of outstanding issues surrounding this current process. In order to end on a somewhat positive note I have brought with me a journal article from Marine Policy By P. Macdonald et al. titled “Fishers’ Knowledge as an indicator of spatial and temporal trends in abundance of commercial fish species” in which the authors describe and prove that fishermen are as good or better than modern analytical assessment methods in predicting current and near future trends in distribution and abundance of fish. I will leave the paper with the staff and would suggest everyone in this room should read it. We need experienced fishermen far more involved in the stock assessment process then they are now. Fishing has been in my family for generations and I have been a commercial fisherman my entire life. In 1990, I was advised to get out of commercial fishing by a reliable source who indicated that our government planned to further limit U.S. fishing efforts in order to trade American technology for foreign fish. Although this information came from someone I trusted, I still found it hard to believe. Either way, the statistics don’t lie. Review of published U.S. edible fishery product import/export data reflects a significant increase in U.S. imports over the years (particularly when compared to exports). Specifically, according to NOAA’s 2013 Imports and Exports of Fishery Products Annual Summary, U.S. imports of edible fishery products have increased from approximately $5.2 billion in 1990 to $18 billion in 2013 (compared to $2.8 billion and $5.19 billion in exports, respectively). Also, U.S. imports of edible fishery products were up a dramatic 8% in 2013 from 2012. Fishing regulations are controlled by politics and big business, not to mention environmental interests. We all want to help preserve our fish stocks, but how about leveling the playing field? In 1976, the U.S. Congress passed the Magnuson Fishery Conservation and Management Act purportedly to “re-Americanize fisheries by controlling or limiting foreign fishing and to restore and conserve the fish.” Since that time, however, foreign factory trawlers continue to fill their holds while local fisherman are forced to endure an ever-tightening noose of regulations that are choking the last breaths out of the industry that put Gloucester on the map. I wish our politicians and the environmentalists would start taking a closer look at foreign seafood imports: how their fish are caught, mesh sizes, and the conditions of farmed-raised products that many environmentalists would never eat. In addition to regulating U.S. fisheries, NOAA is also supposed to be ensuring that international fish stocks are sustainably managed. When it comes to NOAA, I generally find that most people do a good job (with the exception of some former regional leaders who put their personal agendas on the plate of the fisherman). For years, there have been so many promises about listening to the concerns of the fishermen and wanting to improve the relationship between “the industry” and regulators. Meanwhile, local fishermen continue to struggle and international fish imports continue to rise. Gloucester fishermen are honest people trying to make an honest living . . . like our fathers and grandfathers before us. If this industry and our way of life are going to survive, we need our Congress and legislators to use Magnuson for the purpose for which it was originally intended—protecting U.S. fisheries and fishermen—not eliminating our livelihood. God bless America. BYCATCH 14-011 (C7) CGOA TRAWL BYCATCH MANAGEMENT Discussion Paper & CFAs etc. My name is Ludger W. Dochtermann, owner of the F/V Stormbird and F/V Northpoint. Among the species we fish are Halibut and Sablefish. We tender salmon, as well. I remain steadfastly against the allocation of Groundfisheries Catch Shares in the Gulf of Alaska. I especially oppose the awarding of Bycatch Quotas of Halibut, Salmon and other species. Bycatch quotas are an award for harms against the fisheries ecosystem — to the very parties who are conducting the harm. Those harms are profits stolen from Halibut fishermen like us. They do not reflect good stewardship, which calls for REDUCING AND MITIGATING such harms. We must have 100% Observer Coverage in the GOA Groundfisheries, esp. if Bycatch Quotas are to be considered. Your current FMP goal is reduction, not economically rewarding abusers. The Groundfisheries sector’s main problem is one of distorted economic power of Processors over Catch Vessels that continues to lead to drastically reduced dock prices, followed by false wholesale pricing among related corporate affiliates. In other words, an anticompetitive and cartelized market exists. Together, these two formulaic vice jaws firmly “lock in” lower fish taxes and subsequently harm our fisheries dependent coastal communities. Most fisheries find that a result of awarding catch shares, but for GOA groundfish such global, cross border profit transfers are already de facto. In no case, and never before the price vice squeeze is corrected, should any trawler be awarded an economic right to target species, nor the halibut and other bycatch abused species. While opposing Catch Shares altogether, at least quota handouts to those who have been fishing is more appropriate. Our communities should be most concerned for tax intakes and the crewmembers’ spending that pumps up our local economy. I.E., restoring competition. Where Quota Lease Fees are charged – in this case simply to pay unnecessary CFA administrative costs – that diminishes the fish settlement and take home shares of captains and crews. Avoid Bycatch quotas & CFAs, institute 100% Observer Coverage, & eliminate global accounting trickery.